It’s a little joke around town that when I get asked the standard question, “How are you?” my standard reply is, “I’m always well,” to the English speakers; or “Sabai dii samur” to the locals. Now have I discovered not only the elixir of youth but also the secret to permanent health? Unfortunately it is No! on both counts, but those words can have more effect on your life than you would imagine. It’s all to do with PNI. In this rather inexact “newer” science, what the boffins have been able to do is to measure the body’s physical response to emotional stresses. This is not a simple, “I’m under stress so my (blood) pressure’s up,” but is a valid scientific attempt to quantify the psychological insults to the body in physically measurable terms. Not quite rocket science, but getting close. We already knew that those people who “drop their bundle” under stress appeared to do less well than those who kept up a cheery disposition, but it was all fairly anecdotal stuff. However, there were some studies that showed that those people with a positive approach were more likely to “get over” a cancer, or live longer despite the cancer, than those people with a negative attitude. The positive people had significantly better five year survival rates for any cancer, than the negative folk. But we didn’t really know why. As Immunology became a real science, with the ability to measure immune responses by examination of the blood, we began to get a better idea of just what was going on. And guess what? It appeared that people under “stress” depressed their immune system! Was this the answer? Stress reduces your ability to fight things off. Elegantly simple, but unfortunately, too simplistic! Further studies were done by researchers all over the world and the same results were not duplicated. Sure, sometimes stress appeared to reduce personal immune response, but other people did not show the same effects when under the same type of stress. Just who was fooling who? At this stage, someone remembered the old studies on five year survival rates and the differences between positive and negative approaches to life, and the immune response measurements were repeated. Now guess what? The positive people had better “immune counts” than negative thinkers. So it seemed as if the positive thinkers were showing immuno-enhancement while those with negative outlooks and poor coping skills ended up with immuno-suppression. This was, believe me, a real breakthrough. The medical scientific community began to look at disease processes in a new light. The British Medical Journal now reported a very strong relationship between breast cancer and women who were handling stressors poorly. In fact, another study showed that women who were severely depressed were almost four times more likely to die from all causes over a five year follow-up than those who were not. Another study following the progression of HIV showed that those with immuno-suppression (from poor coping skills) doubled the rate of progression of the disease, compared to those with immuno-enhancement. For my money, this is enough. There is some scientific basis for my “Sabai dii samur” and it is that positive thought that I present to you today. Now, “How are you?” And if your reply is “All right, I suppose, but I’m still trying to shake off a cold,” then just remember that the reason the cold is hanging on might just be related to PNI. I am writing to let you know that two years ago whilst in company of friends in Old Blighty (England for your Thai readers), I met this very nice Thai lady who I will (for the obvious reasons) call Nuch. She was (at the time) a bit older than me, she said 48 and I was 30, she had a very nice restaurant, her own nice three Bedroom Semi in a ‘leafy suburb’ (no mortgage), and being divorced she had a very comfortable life. I was married with three kids and living on a combination of state handouts (Dole) and some of my wife’s cleaning money. Nuch and I had a relationship that my wife couldn’t afford and we stayed in nice hotels and ate nice food etc. Nuch would also regularly give me money as I told her I was ‘in-between jobs’. I left my wife and kids (Nuch did not know I was married) and moved in with Nuch. I tried to send you a gift box with the choccies and a Dom Perignon 76, but Nuch’s Visa card (yes I have it) has been cancelled, sorry. I send you love in this email as that is free. Got to go have to sign on. Wow! What a wonderful story! And a fairy story at that. I happen to know for a fact that there is no Dom Perignon ‘76 left anywhere, so that part of your letter was an obvious make-up. And where in the Dickens did you get that pseudonym? Are you trying to make out that you are a wily con artist too, as in Oliver Twist? Shame on you. You bring the name and reputation of an honest con into disrepute! I hope that all older Thai ladies take note of the scurrilous, unfeeling, conniving, grasping nature of you young British people, while professing undying love no doubt, and realize that all you are after is their money, and will do anything underhand to get it. PS: Have you tried using the Visa card in the old slitz machines? Sometimes you can find a bottle shop that isn’t on line and you could get me a couple of bottles of Veuve Clicquot! I have not been here too long, but have met a really wonderful woman who I would like to marry. She is in her mid-40s, like me, and amazingly has never been married, like me too. I have been dating with her for over six months, and I am quite sure that she and I would make it as we are so alike in so many ways as well. How difficult is it to get married here? Would a Thai wedding be recognized by the authorities back home (UK)? I would like to make sure that she would be protected if something should happen to me afterwards. Congratulations on finding your life’s mate, after what has obviously been a long wait. I hope it will all have been worthwhile. Yes, your Thai wedding would be recognized by the British authorities, but that covers the registered wedding at the local Amphur office. The weddings celebrated in the village are very elaborate affairs with much ceremony, such as counting the “sin-sod” (dowry) and the tying of sacred threads around the wrists of the couple (sai-sin) all in the presence of generally nine monks. Unfortunately, despite the ceremony and payment of the dowry, these weddings are not accepted by overseas authorities, so even if you have the ceremonial wedding, you must also register yourselves as man and wife at the Amphur office. This is not a simple affair either, as because you are a foreigner you have to get an affidavit signed by your embassy to state that you are free to marry (not currently married, and if divorced you have to show the originals of divorce papers) and all this has to be translated into Thai, the only official language accepted for legal documents in Thailand (funny that) and verified by the Department of Legalization, a government office in Bangkok. Go to the Amphur some weeks before the agreed wedding date to get the full details required, as it is a lengthy process. However, there is one little detail, but important one, my Petal. You must ask the lady first! You may also be required to speak to her parents and get their permission. Tradition is important in Thailand. Save me some chocolates and a bottle of bubbly from the reception party! Two weeks ago I discussed the relative advantages and disadvantages vis-à-vis using digital and print film. This subject had come up following a letter published in the Bangkok Post, and my column in return prompted a response from a reader (and photographer) in America. It is a reasonably lengthy letter, but the writer brings out some very salient points, and I have published it in toto. “I just finished reading your latest column; ‘Technology is sometimes too smart?’ I found it a thought provoking comparison between film and digital cameras. 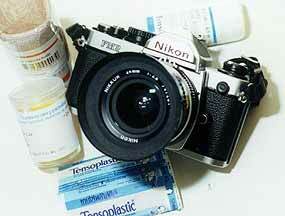 I used film from 1970 until 2005. Enjoyed all those years of snapping away. Did not enjoy having to pay the development costs when I did not use the entire roll of film. Or having everything printed when some were not worth looking at. Then my parents bought me a digital for Christmas 2004 and have not looked back. “I have a few quibbles with the BKK Post letter writer that was having problems with the digital revolution. “1. I now have a Kodak Z612 and I can get 784 photos with a 1 GB SD chip using standard compression and 4.0mp settings. 4 million mp is plenty unless you are enlarging to a huge size. This is considerably more than the 432 frames the letter writer has at his disposal after carrying 12 rolls through countless airport scanners. If I go to 5.3mp setting so I can enlarge to a huge size, I still get 596 shots versus his 432. The nod must go to digital on this score. “2. He states that he has to buy three memory chips at 3,000 baht each to get the same storage as his 432 frames. Nonsense. My 1 GB SD has 596 frames at a high setting and cost me $15 at Fry’s here in Vegas. I can get a 1 GB SD chip online for $10. Long way from his stated 3,000 baht each. He is either exaggerating for effect or shopping at the wrong store. Not a valid complaint IMO. “3. I can delete the shots I know are crap and free up space on my SD chip. Or I can go into almost any photo shop, burn a CD and free up the entire chip. I did this in Vietnam, Laos, Cambodia and Thailand. Cost $3 per CD. Don’t have or need a laptop. Lack of electricity therefore is not an issue. Perhaps Nepal, Tibet and rural Russia do not have shops ready for the digital revolution, but I also doubt they can print anything worthwhile for a film camera either. I seriously doubt the writer would trust his precious photos to a rural photo shop in Tibet. This quibble is without merit as I already have more frames than his 432 without deleting the obviously poor quality shots as I travel. He has to wait until processing and pay to see what he has captured. I know on the LCD screen what I have for free. No comparison between film/digital in this area. “4. Now battery objections. I took four Energizer e Lithium AA batteries with me on my last trip to Asia. I got over 1,200 shots with four AA batteries. This was with my Fuji FinePix A210. If I used an Energizer e Lithium CRV3 Li-ion I would get over 600 shots with my Kodak Z612 with one battery. No need for another battery or a charger. Just buy Lithium. I do have rechargeable CRV3s for my Kodak and the charger is so small it is a non issue. About the size of a pack of cigarettes. This quibble is without merit. “In closing, the BKK Post letter writer obviously loves his film camera and is finding reasons to knock the digital revolution. Fine. We all have freedom to choose what we buy and use. I have used both film and digital and will never buy a roll of film again. Mike, I believe you are quite correct on most of your points. However, I can also understand the BKK Post writer’s love for his film camera. Which is why I still use an FM2N. An interesting report this quarter from our preferred equity managers within our own portfolios - Orbis Investment management. Their global equity fund invests in equities all over the world and seeks to earn higher returns than world stock-markets. The Fund’s Benchmark is the FTSE World Index, including income (“World Index”). The Fund’s currency exposure is managed relative to that of the World Index. Their approach is bottom-up - i.e., they seek out individual stocks, irrespective of where these are located. This is exactly what you want from a chosen equity allocation but the opposite from what you should demand from a portfolio manager. Interestingly, though, this approach has seen the fund’s exposure to companies listed in the US steadily rise from 27% to 42% over the past year. This has been funded out of the reductions in exposure to Japan (27% to 15%) and South Africa (7% to 2%). All of these shifts bring the Fund’s country weighting much closer to benchmark weighting, but they are nonetheless driven by the bottom-up stock-by-stock decisions, and not by top-down macroeconomic analysis of specific countries. Orbis point to recent decisions to buy stocks such as Microsoft and Cisco in the US and to sell Sasol in South Africa as exemplifying this dynamic. Sasol is an integrated oil, gas and chemical company with industry-leading synthetic fuels technology. The Fund initiated a position in Sasol in 2000 when the oil price was around $30 per barrel. Aside from its valuation, at 10 times reasonably depressed earnings, what attracted them most to Sasol was that it owned and operated the world’s largest commercial coal to liquids facility and had viable plans for commercialising the technology. Moreover, unlike most global oil majors that were struggling to replace oil reserves, Sasol had in excess of 30 years of “reserves” in the form of coal deposits. So why did they sell? Firstly, the share price more than quadrupled and relied on continued high oil prices. Secondly, the high oil price brought with it increased risk that taxes would be levied on what could be perceived as windfall profits, adding further uncertainty to the company’s potential for future earnings growth. Lastly, while the stock was still not expensive, they believed Sasol was no longer as attractive as other global investment opportunities that their research process had uncovered. During the time of Sasol’s great run, large-cap growth stocks were terrible performers, badly hung over from the gluttony of the 90s. As a result, they have been until recently the least-loved market segment. Down 70% from its 2000 high, Cisco is typical of these. It is the world’s leading manufacturer of internet networking equipment with dominant positions across various segments. Throughout its history, it has been extremely well managed and has consistently leveraged its high commitment to research and development and technology leadership to great competitive effect. This has translated into superior historic growth rates, both in magnitude and quality, a relationship Orbis fully expect will continue into the future. Cisco is financially sound, supported by a sizable cash stockpile and ample free cash flow generation. Despite Cisco’s exceptional quality and track record of success, the Fund was able to buy it at 17 times next year’s earnings, almost in line with the average p/e of the US stock-market. Cisco happens to be a US company and Sasol South African, so Cisco’s purchase and Sasol’s sale translated into a large shift in country exposure. But, as can be seen in the above descriptions, neither decision was based on benchmark exposure or macroeconomic analysis. They merely reflect the same competitive process for investment capital within the portfolio that has successfully driven the Fund’s investment process since its inception. Above, we have described a bit about one of our preferred equity managers within our own portfolios - Orbis Investment management. As well as their global equity fund, we also hold their Japan fund which invests in Japanese equities in Yen, US$ and Euro classes and their market neutral funds. The Benchmark of the Japan Fund’s Yen Class is the Japanese stock market, measured by the Tokyo Stock Price Index, including income (“TOPIX”). The Yen Class does not hedge currencies and, therefore, is exposed to the Japanese Yen. This US$ and Euro fund includes currency hedging. In all markets, Orbis buy stocks that are selling at a significant discount to what they believe is their intrinsic value. Whilst this approach often leads to stocks that satisfy the low price-to-earnings or price-to-book definitions of value so popular today, there are times when they’ll pick something that doesn’t meet the more traditional value metrics. The key reason for this is the inclusion of growth and quality measures in their assessment of intrinsic value. They are both qualitative and quantitative in their approach. The Japan Fund’s history with Sundrug serves as an excellent example of this. They first acquired Sundrug in 1998 (at the Japan Fund’s inception). At that time, it was a small drugstore chain with a mere 83 stores and 41 billion Yen in revenues. They were very attracted to the opportunity to buy a company with a demonstrated high teens growth rate, 10% return on equity and seemingly limitless future growth potential, even if they had to pay 14 times earnings and 1.6 times book value. This call was richly rewarded over the ensuing two years, capturing a 6-fold price increase before they exited the shares in 2000. In 2003, they began repurchasing the shares at Y350 (split-adjusted) after a correction of nearly two-thirds, and the Orbis Japan Fund now owns over 7% of the company. At today’s price of Y2675 and valuation of 23 times earnings and 4.2 times book value, Sundrug could hardly be considered a traditional value stock. However, they continue to hold it because its other attributes look similar to the first time they purchased it back in 1998. Historic earnings growth has topped 20%, matching its return on equity. Sundrug continues to have excellent management, and importantly, still has plenty of room to grow before becoming mature. With less than 1% market share and 415 stores Orbis believe Sundrug continues to have the ability to grow earnings faster than 15% per annum going forward (as opposed to 5% for the Japanese stock-market as a whole). Sundrug operates in perhaps the most fragmented of all industries, with chains representing less than 20% of the some 74,000 drugstores in Japan. With a generation of entrepreneurs who started their family stores after World War II preparing to retire, this is a sector ripe for consolidation and the expectation is that Sundrug is well positioned for that environment. It is not the largest drugstore chain in Japan but it is the most profitable. Its business model was forged in the most competitive region for drugstores in Japan, Kanto, and it maintains the highest margins in the industry. Sundrug has strict criteria for site selection and is disciplined in not overpaying for locations. As a result, it is unique in the industry as it very rarely has to close stores. Orbis believe Sundrug is a great example of the opportunity that can avail itself when a market becomes intently focused on valuation at the expense of quality and growth. Orbis expect to continue to hold this stock until the pendulum swings and the price offered by the market adequately compensates for the stock’s potential. A community project in Chiang Dao named TB Photovoice Thailand is using photos and stories to tackle often hidden issues surrounding TB and HIV infection, diagnosis, treatment and coping mechanisms. The project is proving that a picture can indeed speak a thousand words, but even more than that, it can help influence social change. Thailand is ranked 18th among countries with high TB incidence according to the World Health Organization’s (WHO) TB 2006 report, and has approximately 570,000 people living with HIV. It is estimated an average of 30 percent of people living with HIV and AIDS are co-infected with TB. HIV infection increases the demands on TB programs through the need for better diagnostic tools, monitoring and treatment. A combination of HIV-related tuberculosis (TB) and an inadequate provision of treatment and community awareness among a myriad of migrant groups is reversing gains made in TB control. Coordinator Kaetwa Sangsuk demonstrates how to use cameras for their project. Clinical diagnosis of TB is more difficult in co-infected patients, since similar symptoms can be caused by various infections. In addition, there’s also increasing evidence of multi-drug resistant TB (MDR-TB) in the country. In the TB Photovoice project, people with experiences of TB take photos of their daily lives, and write personal essays based on the pictures, with an ultimate goal to influence change in the way society perceives the disease. According to Caroline Wang, creator of the photo-voice methodology, photo-voice is a process by which people can identify, represent and enhance their community through a specific photographic technique. “This project aims to raise awareness on TB and HIV in Thailand. Through pictures people can tell their stories, share some of their problems, and give recommendations as individuals affected by TB and HIV,” said Kaetwa Sangsuk, TB Photovoice Thailand’s coordinator. Poverty and a vast diversity in language and culture posit a challenge to reach immigrant groups with much-needed TB/HIV education and treatment. It is clear that to be effective TB/HIV services in Thailand require an active engagement with local communities, especially migrant groups that are often marginalized. Equipped with essential local knowledge and experience, TB/HIV control programs can exponentially increase their effectiveness. Local communities need to be involved in the planning, implementation and evaluation of TB control programs. Using pictures to communicate about TB/HIV in low literacy contexts, can significantly improve community awareness as well as the impact of medical responses to the disease. Participants in the TB Photovoice Thailand project came from a TB/HIV support group in Chiang Dao and Muang district in Chiang Mai province, in the north of Thailand. Chiang Dao — a border district — has a population of 74,000, and nearly half are immigrants. The majorities of the migrants are poor and work in the agricultural sector. The district has one of the highest TB prevalence rates in Chiang Mai province. The participants received training on how to take photographs, and were then given cameras to enable them to take pictures that document their experiences of TB. Through taking and writing about the pictures, participants undergo a process that helps them to introspect about difficult issues associated with TB and its implications to their health and community. “All my pictures are about my experience with TB. They show the various stages of TB, including treatment and recovery,” said Narai Daenchai, 29, a participant in the TB Photovoice project. In 2005, Daenchai was diagnosed as TB-infected. Like many of the project’s participants, Daenchai was already living with HIV but he knew little about the connection between HIV and TB. He fell sick and lost a lot of weight. He even locked himself away in his room to keep away from attention until he finally sought treatment. Throughout that period, his mother was his pillar of support. She fed him and prayed for him. Today, Denchai thanks his mother for staying by his side during his illness. “I was in treatment for almost nine months; now everything is almost back to normal except that I cannot do too much work because my lungs are still weak,” said Daenchai. 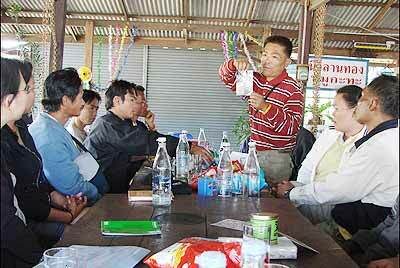 Last year, he joined TB Photovoice through the Chiang Dao Hospital’s People Living with HIV and AIDS support group. In an attempt to reach out to the community, the photographs taken by participants are also displayed at the Chiang Dao Hospital to help attendants to gain knowledge about the disease. Coming together at monthly sessions, participants get to share experiences and feelings through the pictures and offer each other emotional support. Having someone in the community who has had personal experience with TB, and can prove that it is treatable is a critical component in helping communities to respond to the problem of TB. Participants use pictures and their personal stories to advocate for TB/HIV treatment in their communities. At Chiang Dao Hospital, the participants maintain a bulletin board which shows their pictures, stories and information about TB infection and treatment. “The project is very good because by providing health communication within our communities, it fills a gap left by government,” said Nuttawardee Areenu, a nurse in the TB/HIV unit of Chiang Dao Hospital. TB Photovoice was founded in November 2004 by Romel Lacson shortly after his wife Claudia and their unborn child succumbed to TB Meningitis in July 2004. The goal of the project is to provide local people around the world with a voice to articulate best practices and obstacles toward TB eradication, and to assist local communities to disseminate this knowledge, including media awareness of the toll that TB exacts upon millions of lives. A bulletin board at the Chiang Dao Hospital monitors their progress through pictures. Educating through pictures to eliminate TB in Chiang Dao. The most important factor relates to the student’s primary motivation. Language theorists often describe a language student’s primary form of motivation as either instrumental or integrative motivation. Instrumental motivation is the weaker form. Common among those learning English, for example, with no intention of ever living in a country like Britain or Canada, instrumental motivation is the prime mover of those who want to learn a language as a tool for some secondary purpose – talking to tourists, for example. Integrative motivation is a greater force. It is the motivation of those who are learning a second language in a new country, and they are learning the language so they can integrate into a new society. The second fundamental factor affecting language learning is the amount of time the student spends in class and practicing the language. Generally speaking, more motivated students spend more time; less motivated students, less. The third factor is the teacher’s approach (for example, communicative language teaching or audiolingualism) to language teaching. The fourth is the instructor’s teaching effectiveness and style. You can probably see a big problem here. The myth of the great teacher whose motivational abilities inspire her students to world-shattering achievements is essentially flawed. I think of this as the paradox of motivation. The student’s main motivator - integrative or instrumental motivation - is the one factor the teacher essentially has no control over. And that motivation drives the second most important factor behind student success, time spent on task. What’s a teacher to do? Accept this reality, and develop your ability to motivate students in secondary ways. Primary motivation notwithstanding, the teacher’s motivational skills are still critical for both learning and teaching. Good teachers use many teaching qualities to motivate students. These include a combination of variation and structure in teaching activities. They find ways to show the practical value of learning English. They encourage and nurture their students, and many excellent teachers also bring sympathy and empathy into the classroom. They make the physical teaching space as compatible with learning as they can. They offer tools for learning (for example, mnemonics) and they conduct the class in a fair and balanced way. They also provide the students with consistency and fairness, and they do everything they can to help the students feel safe. What TEFL teachers think: In a recent class, I discussed this problem with my TEFL (teaching English as a foreign language) students, and asked them to brainstorm ways to motivate their students. They concluded that there are five areas where the teacher can really make a difference: in their lesson plans, in classroom management, in teaching style, in testing and assessment and in professional development. By no means were their ideas exhaustive, but they were good. Here is a summary. 1. Create great lesson plans: Choose great topics. Provide interesting and varied activities. Develop medium-term class themes. Have attainable goals and objectives, which provide real challenges but seek progress, not perfection. KISS (Keep it short and simple). And use authentic materials and situations for classroom teaching. 2. Classroom management: Attend to your students’ comfort and convenience. Find ways to visually represent class progress. Set up the classroom effectively and use equipment as effectively as you can. 3. Teaching style: Your teaching style consists of attitude, presence and rapport. Here are some comments on each. • Attitude: Know your students’ names. Activate their prior knowledge and nurture their abilities. Be knowledgeable and authoritative, but modest. Be passionate about teaching. Be punctual. Dress and groom professionally. • Rapport: Appeal to different learning styles, especially kinaesthetic. Be conscious and respectful of your students’ culture or cultures. Give genuine praise and recognition. Involve the students in their learning; for example, use KWL (“what you know, what you want to know, what you have learned”) charts to develop and measure class content. Offer appropriate counsel and advice. 4. Assessment: Give your students good and regular assessment and testing. Get them to help each other. Monitor the class through feedback, and use prizes as rewards from time to time. 5. Professional development: Keep a log of your classroom performance, on occasion get someone to video your performance, and periodically ask a colleague or friend to assess your teaching. And take advantage of whatever professional development training you can get your hands on. We can always improve, and we must.